There are many unique tax rules that affect your family child care business: Time-Space percentage, Food Program and food expenses, general house expenses, and more. 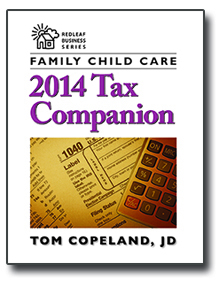 The Family Child Care 2014 Tax Companion is a comprehensive tool that will help your tax preparer understand your business. Using this resource will increase your confidence in the tax professional who prepares your return, help you identify potential errors before your taxes are filed, and ensure that your tax preparer is claiming all allowable deductions. Once you fill out the worksheets in this book, give it to your tax professional to use as a guide as he or she completes your tax forms. When you get your forms back from your tax professional, compare them with what is on your worksheets. This will help you ensure your business expenses were properly deducted. It also serves as a record of how your tax return was completed in case you are ever audited by the IRS. Restrictions apply to date-sensitive materials. The most comprehensive resource available, this book contains up-to-date guidance so you can accurately complete your own tax return and take advantage of all the business deductions that you're entitled to claim. It contains information about new tax laws, tips to help you save money, and tools that will take the guesswork out of doing your taxes. 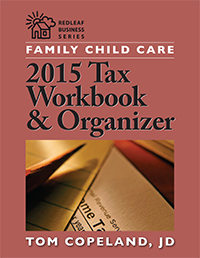 The Family Child Care 2015 Tax Workbook and Organizer provides updates on retirement plan limits and Saver's Credit limits, and highlights from recent Tax Court cases. There are many unique tax rules that affect your family child care business: Time-Space percentage, Food Program and food expenses, general house expenses, and more. 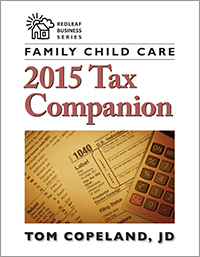 The Family Child Care 2015 Tax Companion is a comprehensive tool that will help your tax preparer understand your business. Using this resource will increase your confidence in the tax professional who prepares your return, help you identify potential errors before your taxes are filed, and ensure that your tax preparer is claiming all allowable deductions.